Marfan syndrome is a disorder of connective tissue. This is the tissue that strengthens the body's structures. Disorders of connective tissue affect the skeletal system, cardiovascular system, eyes, and skin. Marfan syndrome is caused by defects in a gene called fibrillin-1. Fibrillin-1 plays an important role as the building block for connective tissue in the body. The gene defect also causes the long bones of the body to grow too much. People with this syndrome have tall height and long arms and legs. How this overgrowth happens is not well understood. In most cases, Marfan syndrome is passed down through families (inherited). However, up to 30% of people have no family history, which is called "sporadic." In sporadic cases, the syndrome is believed to be caused by a new gene change. People with Marfan syndrome are very often tall with long, thin arms and legs and spider-like fingers (called arachnodactyly). The length of the arms is greater than height when arms are stretched out. Many people with Marfan syndrome suffer from chronic muscle and joint pain. An echocardiogram or another test should be done every year to look at the base of the aorta and possibly the heart valves. Vision problems should be treated when possible. Monitor for scoliosis, especially during the teenage years. Medicine to slow the heart rate and lower blood pressure may help prevent stress on the aorta. To avoid injuring the aorta, people with the condition should avoid participating in contact sports. Some people may need surgery to replace the aortic root and valve. People with Marfan syndrome who have heart valve conditions may need to take antibiotics before dental procedures to prevent endocarditis (infection of the valves). Pregnant women with Marfan syndrome must be monitored very closely because of the increased stress on the heart and aorta. Heart-related complications may shorten the lifespan of people with this disease. However, many people live into their 60s and beyond. Good care and surgery may further extend lifespan. Couples who have this condition and are planning to have children may want to talk to a genetic counselor before starting a family. Spontaneous new gene mutations leading to Marfan (less than one third of cases) cannot be prevented. If you have Marfan syndrome, see your provider at least once every year. Doyle A, Doyle JJ, Dietz HC. Marfan syndrome. In: Kliegman RM, Stanton BF, St. Geme JW, Schor NF, eds. Nelson Textbook of Pediatrics. 20th ed. Philadelphia, PA: Elsevier; 2016:chap 702. Madan-Khetarpal S, Arnold G. Genetic disorders and dysmorphic conditions. In: Zitelli, BJ, McIntire SC, Norwalk AJ, eds. Zitelli and Davis' Atlas of Pediatric Diagnosis. 7th ed. Philadelphia, PA: Elsevier; 2018:chap 1. Pyeritz RE. Inherited diseases of connective tissue. In: Goldman L, Schafer AI, eds. Goldman-Cecil Medicine. 24th ed. Philadelphia, PA: Elsevier Saunders; 2016:chap 260. 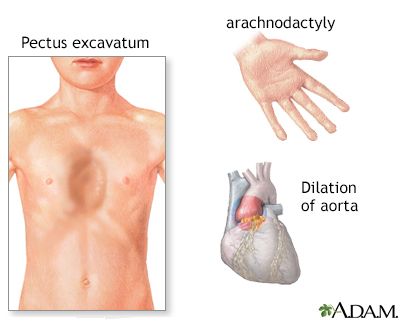 Pectus excavatum is a condition in which the breast bone (sternum) appears sunken and the chest concave. It is sometimes called funnel chest. The majority of these cases are not associated with any other condition (isolated findings). 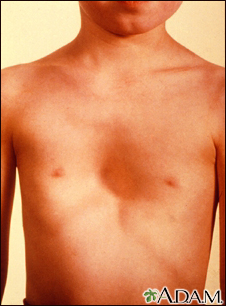 However, some genetic conditions include pectus excavatum. Marfan syndrome is a disorder of connective tissue which causes skeletal defects typically recognized in a tall, lanky person. A person with Marfan syndrome may exhibit long limbs and spider-like fingers, chest abnormalities, curvature of the spine and a particular set of facial features including a highly arched palate, and crowded teeth. The most significant of the defects in the syndrome are cardiovascular abnormalities, which may include enlargement (dilatation) of the base of the aorta. Since Marfan syndrome is usually an inherited disorder, prospective parents with a family history of Marfan syndrome should get genetic counseling.